Tom and Betsy Rather are an attractive suburban couple in their late 20s, early 30s. They both went to good schools and graduated from college. Tom distinguished himself in the most recent war. They love each other and seem to have everything going for them, including three happy, healthy children. They also own their own home, and Tom has a respectable job in the big city, while Betsy stays home to raise the kids. By the time they had lived seven years in the little house on Greentree Avenue, they both detested it. There were many reasons, none of them logical, but all of them compelling. For one thing, the house had a kind of evil genius for displaying proof of their weaknesses and wiping out all traces of their strengths. The ragged lawn and weed-filled garden proclaimed to passers-by and the neighbors that Thomas R. Rath and his family disliked “working around the place” and couldn’t afford to pay someone else to do it. Tom and Betsy assured each other that someday they would have the whole wall re-plastered, but they never did. The crack remained as a perpetual reminder of Betsy's moment of extravagance, Tom’s moment of violence, and their inability either to fix walls properly or to pay to have them fixed. A thousand petty shabbinesses bore witness to the negligence of the Raths. The front door had been scratched by a dog which had been run over the year before. The hot-water faucet in the bathroom dripped. Almost all the furniture needed to be refinished, reupholstered, or cleaned. And besides that, the house was too small, ugly, and almost precisely like the houses on all sides of it. “Of course we shouldn’t,” Tom said. Their words sounded hollow. It was curious to believe that that house with the crack in the form of a question mark on the wall was probably the end of their personal road. It was impossible to believe. Somehow something would have to happen. The excerpt I’ve just quoted comes from a novel, The Man in the Gray Flannel Suit by Sloan Wilson, which was a universally acclaimed best seller when it was first published in the middle of the 20th century. I recently read the novel, thanks to the recommendation of a Crazy reader, who shares my my continuing interest in "suburban studies." This Walnut Creek-based reader has his own excellent blog, Litterbury, where he currently looks at White Noise by Don DeLillo, which is celebrating its 25th anniversary and which like, The Man in the Gray Flannel Suit, offers an excellent examination of the dark side of American suburban life. 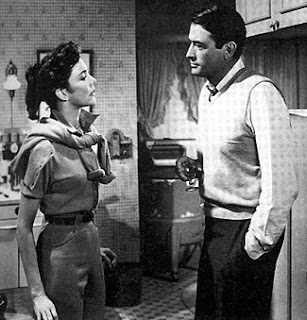 You may have heard of The Man in the Gray Flannel Suit, or of the film version, starring Gregory Peck and Jennifer Jones. Or maybe you’ve heard the term, "the man in the gray flannel suit" to refer to the anonymous corporate man, the backbone of America's mid-century financial success. That terms has become a part of our cultural lexicon. Anyway, this book may be 55 years old, and it may be set in New York City and its suburbs (like the TV show Mad Man). But like that TV show, much of what this book has to say--about marriage, family, life in the suburbs and the upwardly mobile middle class--is just as relevant to us today. This book speaks with an urgency, timelessness, and truth that is very recognizable and even painful--to me anyway. This book and the movie are all time favorites of mine. Read the book when I was just 13 much to the shock of the town librarian! It is still very revelent today and a good read for everyone.